At the end of a summer of discontent over gender stereotyping, exclusive research commissioned by Campaign reveals that parents blame brands for perpetuating inequality. The poll, conducted by Toluna among 700 parents of children aged 16 or under, found that 77% of parents think that brands perpetuate stereotypes with the clothes, shoes and toys they sell for girls and boys. It also found that 65% think the traditional colour scheme of blue for boys and pink for girls is now outdated. The research follows a summer where gender stereotyping by brands was never far from the headlines, with consumers talking to social media to call out stereotyping. High street shoe brand Clarks found itself in the firing line after creating a school shoe for girls called "Dolly Babe", while a shoe for boys was called "Leader". The move prompted a wave of criticism on social media with Scotland’s first minister, Nicola Sturgeon tweeting: "It is almost beyond belief that in 2017 a major company could think this is any way acceptable. Shows what we are still up against." Gender stereotyping, particularly when it comes to children clothes, is a pressing issue for brands. 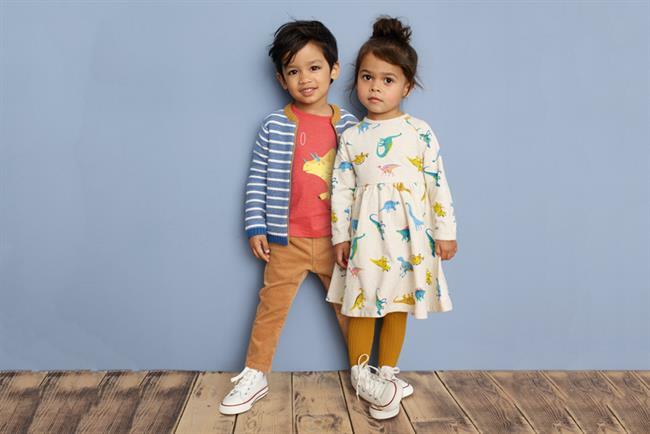 The issue was driven up the agenda once again last weekend by a flurry of media coverage over John Lewis’ move to introduce non-gender specific labels in our its own brand children’s clothing. The coverage, which "surprised" the retailer as the changes were introduced in January, sparked praise on social media. A John Lewis spokeswoman said: "At the beginning of 2016 we introduced non-gender specific labels in our own brand children’s clothing, and this was followed by the removal of 'girls’ and ‘boys’ signage in our shops which was replaced with photos of children modelling our clothes. "In our shops, girls and boys clothing are still positioned in the same way as they have always been and online customers can search by ‘girl’ or ‘boy’ if they choose to." The research reflected a more fluid approach to gender segmentation of clothing with 29% of respondents saying that of girls are allowed to wear skirts to school boys should be as well. The argument that advertising is simply reflecting existing inequalities in society appears to be running out of steam; 65% of parents said advertising has a responsibility to drive equality. The focus follows the introduction of new guidelines from the Advertising Standards Authority to tackle gender stereotyping in advertising. The sensitivity of this issue was highlighted by the reaction to the recent Dolmio ad which depicted a mum in the kitchen while the dad (Dominic West) plays videogames with his son. Almost half (49%) of parents thought it was fine for a brand to create an ad depicting this scene, while 42% objected. This divided opinion was highlighted by consumers interviewed for Campaign by behavioural research agency Watch Me Think who had mixed views on the ad. Some viewing it as "incredibly sexist" while others said it was a reflection of reality or "a bit of fun". Do you think advertising reinforces gender stereotyping? Do you think brands perpetuate stereotypes with the clothes, shoes and toys they sell for girls and boys? Is the traditional colour scheme of blue for boys and pink for girls outdated now? Is it OK for a brand to create an ad of a mum cooking in the kitchen while a dad and sons play video games? "Advertisers have every right to show mums doing the cooking because this reflects reality." Do you agree or disagree with this statement? "Advertisers should seek to challenge gender stereotypes." Do you agree or disagree with this statement?